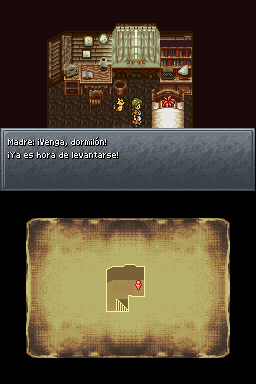 The DS version of Chrono Trigger is a pretty good upgrade. It polishes up and uncensors the text because it has more space to do so, puts in some neat extras, and even throws in the PS1 edition’s spectacular FMVs without the previous port’s loading times. Extras include a monster raising/battling minigame, a few extra quests, a bestiary, and a new ending that ties in to Chrono Cross. There are two reasons why there are some naysayers to this edition however: some disagree with Frog being changed from Ye Olde English to just formal speech as to them it removes some charm (my honest personal opinion: I see the point, but I like the DS version better as no one in the Middle Ages talks in Ye Olde anyway), and the new ending appears to be pretty tacked-on. The latter however is completely optional. 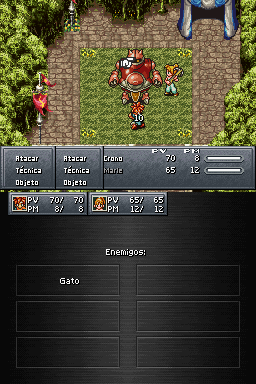 All in all this is a terrific version of one of the most celebrated JRPGs for players both old and new. 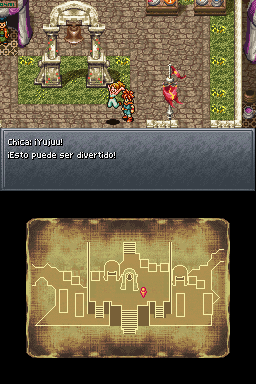 The Nintendo DS port of Chrono Trigger was successfully translated back in 2009. 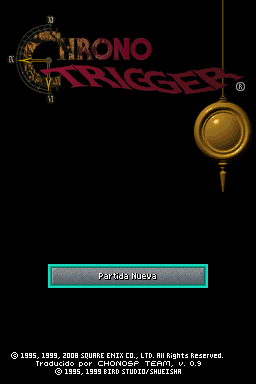 Spanish RPG fans felt deceived after Square-Enix decided not to release an official Spanish translation of the game in Spain, thus rendering this patch widely received by the Spanish romhacking community. 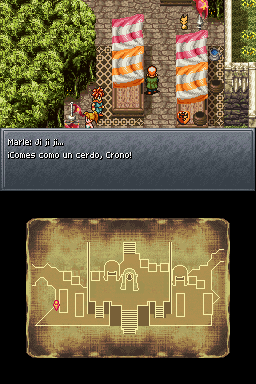 Chrono Trigger would not officially have an Spanish translation until it was ported to Android and iOS devices. The patch has been uploaded to RHDN for conservation purposes only. Cheats originally included have been removed. If you need them, please check an updated cheat database. This patch is not compatible with the Anti-Piracy FIX.